The origins of the Synoptic Gospels-Matthew, Mark, and Luke-have long been the subject of study and speculation. In recent years, however, discussion has come to a standstill with little hard evidence being offered. Two Gospels from One promises to move scholarship forward as the first approach to systematically look at the synoptic problem by employing textual criticism. The highlight of Williams's research can be seen in a pericope-by-pericope analysis of 173 verses of Mark's gospel (with the corresponding Matthean parallel). 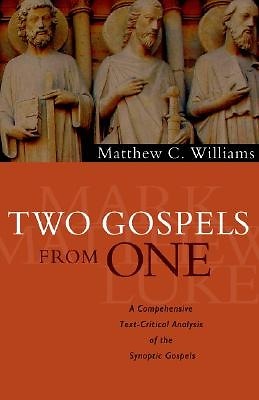 Using principles of textual criticism in comparing these passages, Williams convincingly shows the likelihood that the gospel of Mark was indeed written first and used as a source by Matthew. Two Gospels from One stands to be an important contribution to New Testament studies and a major work to be considered by professors, students, and pastors interested in the relationship between and origins of the first three Gospels.